I’ve been having so much fun participating in Set To Stunning‘s #nerdvember. The nerdy-themed outfit of the day Instagram contest got me thinking about two of my favorite chic geek outfits from the past. 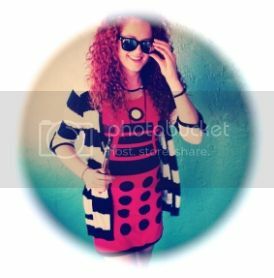 First up is the outfit I wore for the Doctor Who 50th Anniversary special: my Her Universe Red Dalek Dress with my black & white cardigan and some villain inspired jewelry including my Adipose earrings and a [Max] Capricorn necklace. On the left: all the items I bought for this costume – a lime green jacket from goodwill for $2, purple mask, mini purple and black topcoat, “steampunk” goggles, metal buttons and chain link from Wal-Mart (about $20 total), purple gloves and bowtie from Party City (about $8). I also bought a black tutu but didn’t end up using it with this costume. The purple tights from Target pictured with the purchased items, I actually had in my sock and tights drawer but they originally cost about $3. One the right: all the items I already had – black corset, long black sheer skirt, lime green lace bra, lime green and white thigh-high stockings, short black shorts and white garter belt. 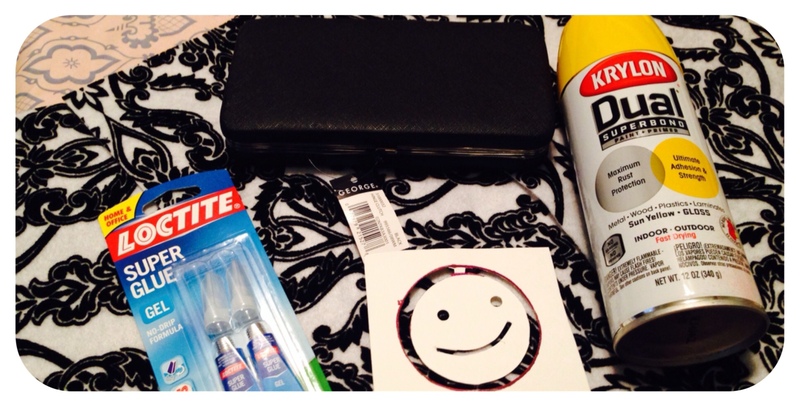 On my previously mentioned trip to Wal-Mart for costume supplies, I also picked up some pray paint, fabric dye, ribbon, glitter and iron-on question marks (that I also didn’t end up using). 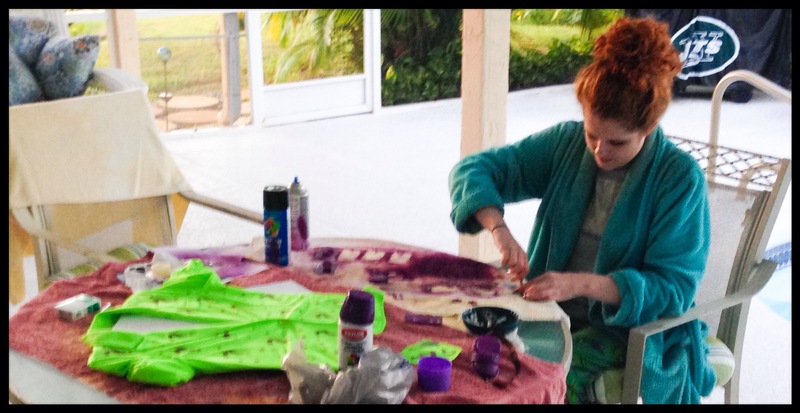 I had more purple spray paint, fabric glue and stencils. I got to work. I sewed the buttons and segments of the chain to the front of the jacket. (I sewed on four of the above pictured sets total). Using the lime green fabric dye, I set out to transform the white garter belt and stockings. 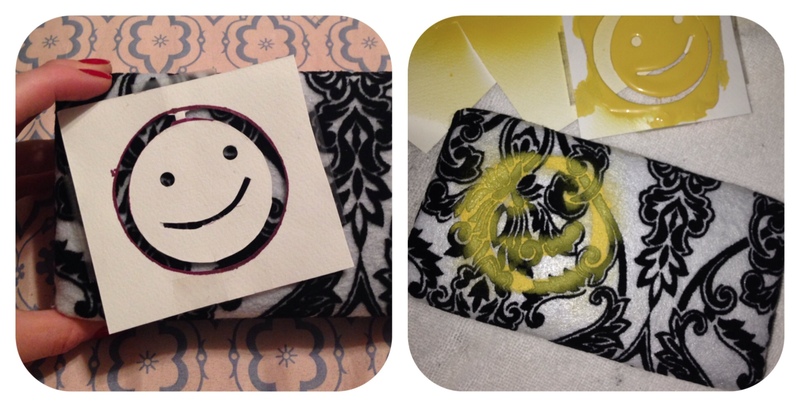 This was the second time I ever attempted to use fabric dye and this was the second time it completely didn’t work. On the package it states that best results are not achieved on synthetic fabrics like nylon but you would assume it would work a little. No. As soon as I rinse the garments the color rinses completely out as if it weren’t dyed at all. I went with my usual means of dyeing to get this job done: Sharpies. Now, in the past I have mixed and made various shades buy combining Sharpie “ink-thingys” in squeeze bottles full of rubbing alcohol. I use these solutions to dye wigs usually. (And it works freaking fantastic!) 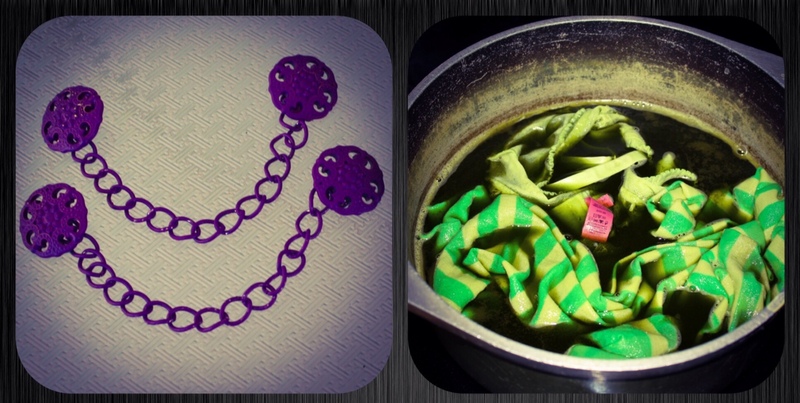 This time, I threw these ink-thingys into a shallow pot of boiling water after removing from heat and then added the lingerie. I let them soak for about 10 minutes which was probably way more time than even necessary (compared to the hour time with that good-for-nothing fabric dye). 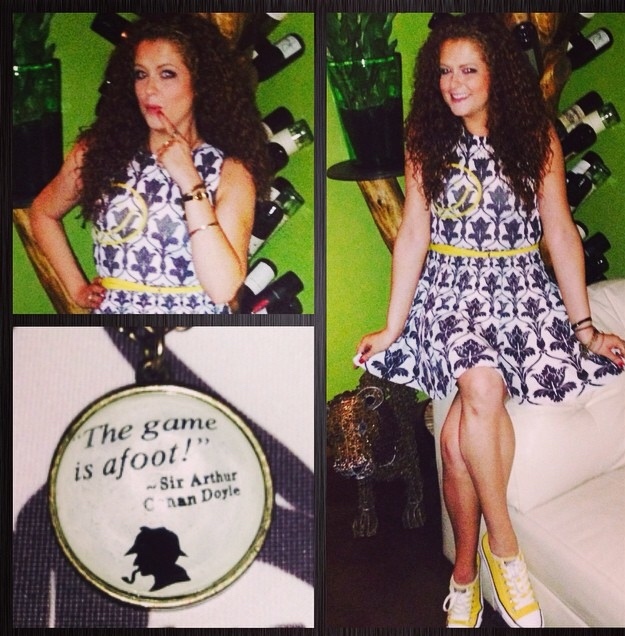 Many weeks ago, before SDCC, I ordered the Bored A-Line dress from Gold Bubble Clothing’s Sherlock Holmes collection. Through all the Doctor Who activities, I haven’t had a chance to wear it yet. I want to begin by saying that the customer service team at Gold Bubble is impeccable! I wrote to then requesting to receive my order before SDCC (under the guise that I was actually planning on attending SDCC) and the team went out of their way to email and text me while they were attending SDCC to get me my fabulous dress. Of course, not being at the convention, or even in the same time zone, I didn’t get my order early. But they tried, hard! I paired my dress with a thin yellow belt to accentuate the yellow smiley face on the chest and my yellow converse all stars. 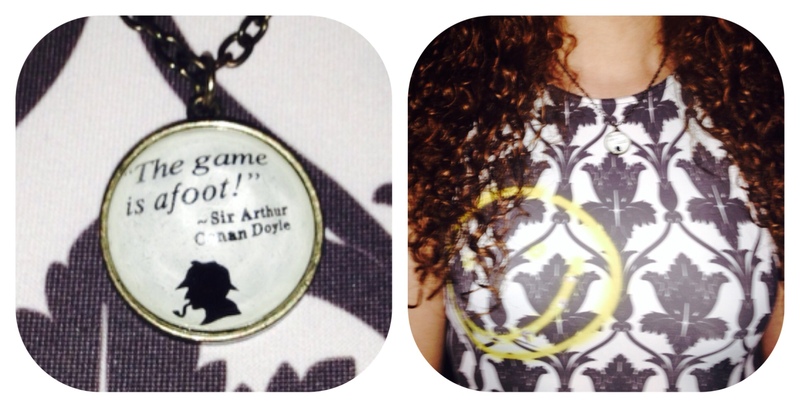 To add extra Sherlock to my look, I wore my “The Game Is Afoot” necklace that I found at Hot Topic. This is one of my favorite dresses that I’ve ever owned! It fits so perfectly and I love how feminine it is. 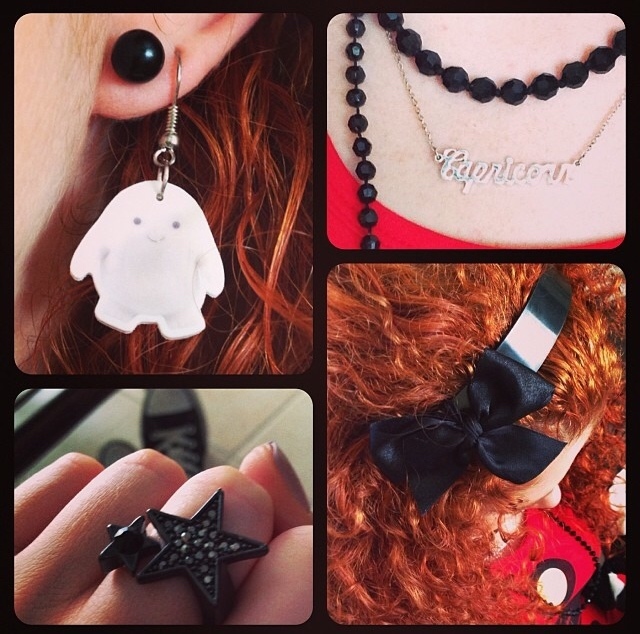 Only a true Sherlock fan would even be able to spot this fangirl fashion must-have! Check out the entire Sherlock Holmes Collection from Gold Bubble Clothing! 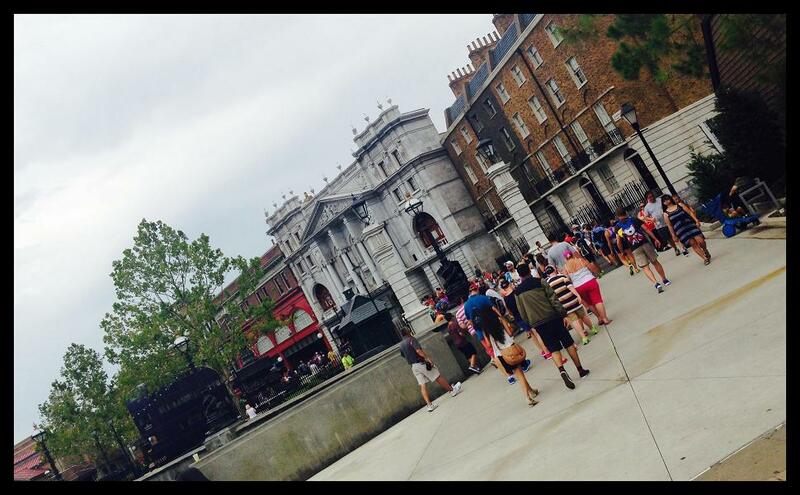 A week ago, today, I visited the brand new, Wizarding World of Harry Potter – Diagon Alley at Universal Studios, Orlando! I’m so fortunate to have the friends I have for making this incredible dream of a day come true. When we woke up Tuesday morning, we greeted the day with news that the super-awesome-all access-pass-card was obtained and available for our use to enter and play in the park! Ron, Nicki and I met up with Brad at Islands of Adventure to obtain this “golden key” a hopped on the Hogwarts Express at Hogsmeade Station. 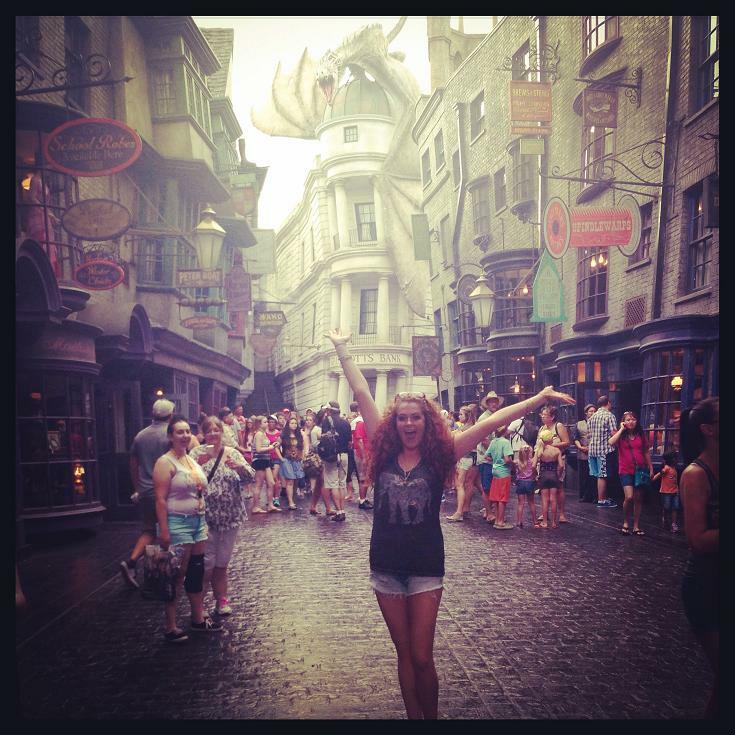 Having explored Hogsmeade multiple times in the past, we were eager to get to Diagon Alley. Fancy status: The three of us were granted our own car on the train for our trip to London upon Brad’s polite request after not waiting even a moment in line. Phones and cameras weren’t allowed on the train, but we managed to snap a quick couple before the ride really got going. After a delightful trip into the city, we arrived at Kings Cross Station. There are shops everywhere! And all of the details surround you! You are in a completely different world. 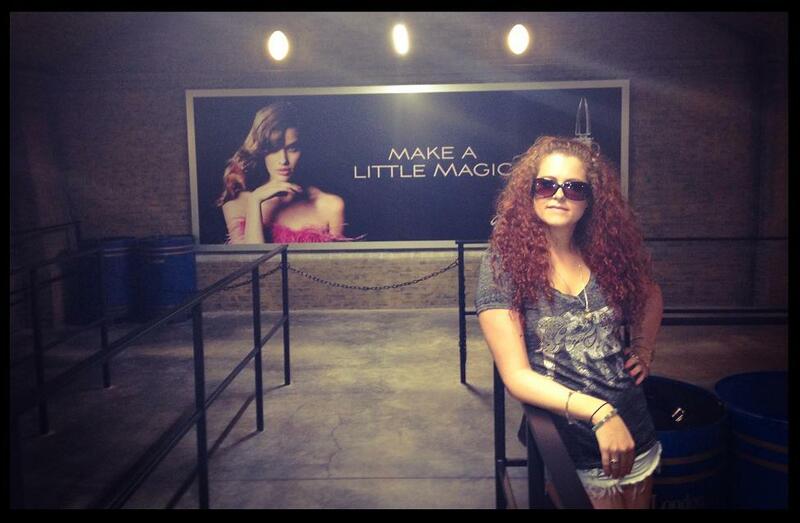 You’re in the Wizarding World. You’re in Diagon Alley. I simply couldn’t contain myself. After some exploring, we ventured into Knockturn Alley. Never have I ever wanted to be Slytherin more than there and then. It was absolutely incredible! I even did some dark mark shopping at Borgin and Burkes. DIagon Alley had lots of really amazing shops including Weasley’s Wizard Wheezes, Magical Menagerie (pet shop) and a Quiddich Shop. One particularly beautiful store was Wiseacre’s Wizarding Equipment. Being super-duper VIP did have one downfall. Because we don’t wait in lines, I didn’t get to experience the queue for Escape from Gringotts the ride. From what I understand it is completely breathtaking, taking you through the grand bank lobby and into an elevator. I look forward to experiencing that on a future visit. The ride was pretty fun! It could’ve ended a bit more exciting but overall I really enjoyed it. 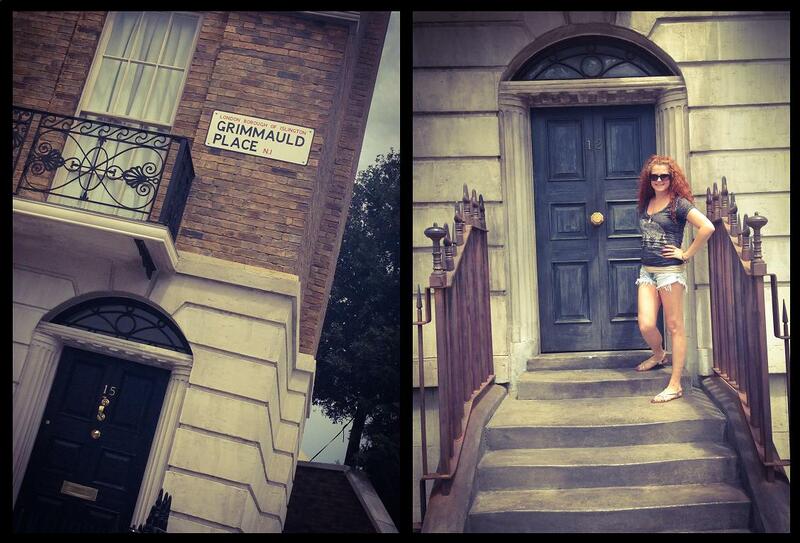 Connecting and disguising Diagon Alley from the rest of Universal Studios is [Harry Potter’s] London. The shrunken head on the knightbus hit on me which was awesome and I got to see Kreacher in the window of 12 Grimmauld Place. While on the Universal Studios side we also rode the new-ish Transformers ride. It was my first time on that one and we grabbed lunch at Moe’s Tavern in Springfield. We headed back to Kings Cross Station for our trip back to Hogsmeade and this is where I realized just how amazing Kings Cross Station was here. We got to blatantly skip a super crazy packed line and I shouted “silly muggles!” at the on-lookers (rather, hard-starers and stink-face-makers). I had such an incredible time! I can’t thank Ron and Brad enough for making this trip not only possible but also so special with the VIP treatment. 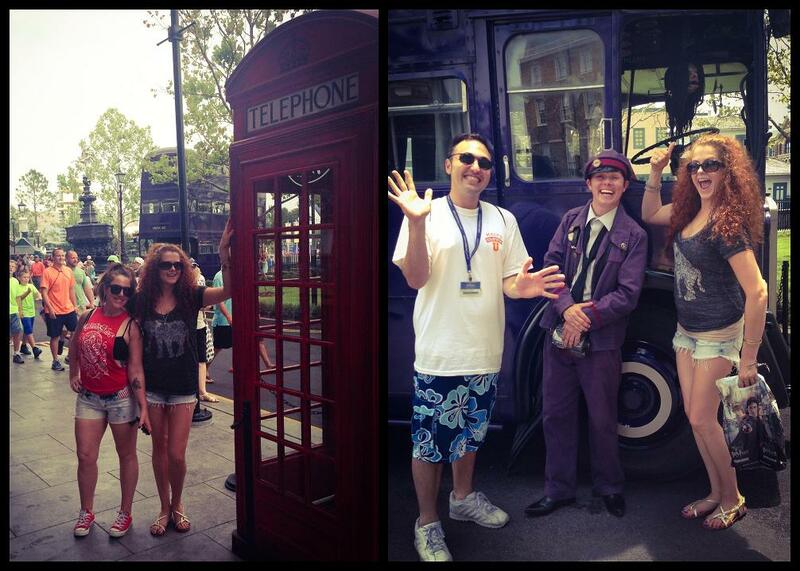 I already can’t wait to go back and when I do, I’m going to eat my way through the Wizarding World. During the day, I took a lot of random videos. I put a few of them together and as long as you don’t mind shoddy camerawork and up-the-nose shots, enjoy a peek at my very first time visiting Diagon Alley. 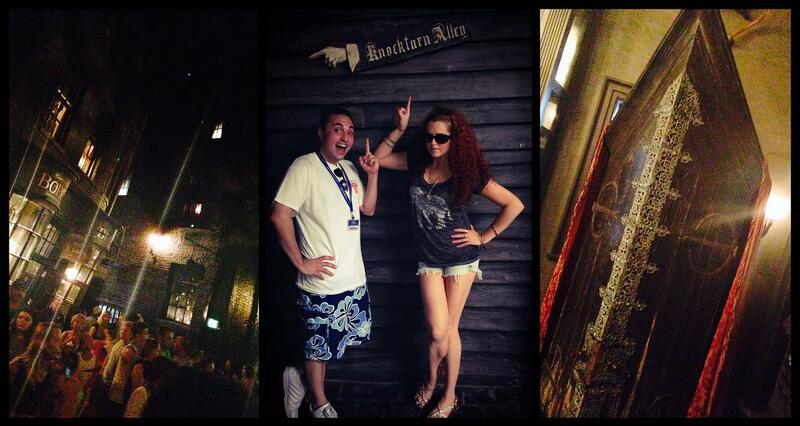 In honor of my very first trip to Diagon Alley, I wanted to share some throwback shots of my first trip to Hogsmeade. I would’ve had to break out one of my other hard drives to share all my favorite pictures from that day and I simply didn’t feel like it. Instead I threw in some pics from another one of the times I visited the Wizarding World – Hogsmeade/Hogwarts in the past.